The planet Venus is named after the Greek Goddess Aphrodite who represented everything that was beautiful. In Astrology and for horoscope purposes the influence of Venus is used to identify grace and creativity within a personality. It also highlights levels of a person's kindness, sensitivity and compassion. This planetary presence in a natal astrological reading additionally concerns and concentrates on the making of decisions. Venus cycles in orbit roughly once a year and so its influential power is widely spread between all twelve Western Astrology Sun signs. Its placement in your birth chart for horoscope analysis will indicate the strength of your emotional state and your decisiveness. Venus is the second closest planet to the Sun and it is known as the Morning or Evening star as it is brightest at these times. 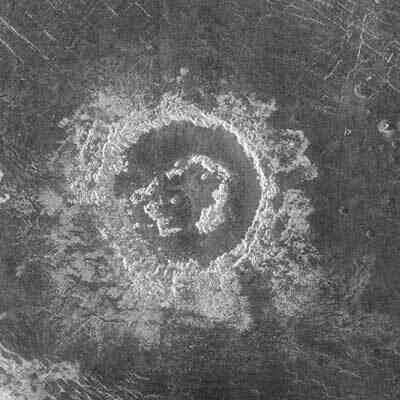 It is a of similar size to Earth with a core, mantle and crust but its surface is covered with a layer of sulphuric acid clouds. 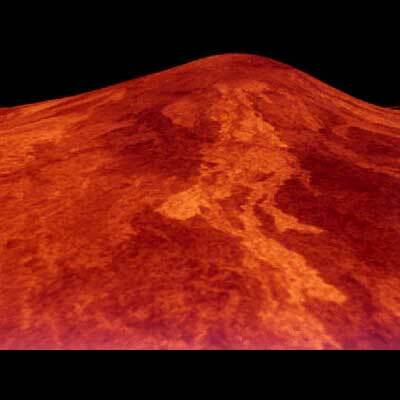 The Venus atmosphere is made up of mainly carbon dioxide and it has a mysterious, dusty, desert type landscape. If someone has a strong presence of Venus in their astrological profile it usually indicates the likelihood of an attractive feature. Depending where and when Venus is displayed in a natal chart will determine which parts of the personality will be influenced. There are only two or three well know myths that have a connection with the planet Venus. These tales are from the Romans, Mayans and Norse people who have passed them down though the centuries. The Roman's were responsible for renaming the Grecian deity Aphrodite to Venus and naming the planet in her image. The Mayan population believed that Venus was the planet of warfare and followed its path carefully. They designed their houses to be aligned in the best positions, especially windows and doors, for viewing it. 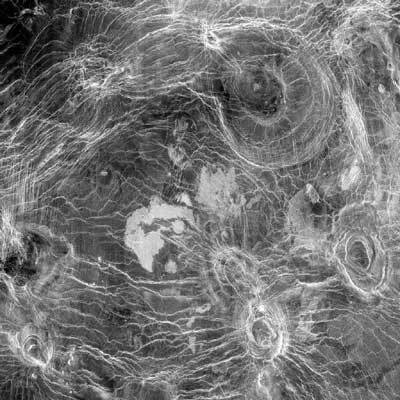 In Norse mythology it is thought that one of the volcano's on Venus is named after the golden haired and very beautiful Norse Goddess Sif. Most myths and legends about Venus though out history have signified this planet's association with beauty rather than war. The Mayan's were totally alone in their viewpoint of this planet's significance, most cultures regard it as the planet of love and maternal affection. It is significant for these reasons in terms of Astrology and towards horoscope interpretation. Wherever Venus is prevalent in someone's character reading will be enhanced with loveliness and a certain appeal. It will also emphasize their decisive or indecisive nature and sometimes the speed of their decisions or impulsiveness. This knowledge can be very revealing and provide clues to someone's way of thinking. Peeking into and analyzing the positioning of Venus in a birth chart can reveal lots of little extras to a personality assessment. While it does not give general or specific revelations it is extremely useful in acquiring additional and relevant information. Looking at the location of Venus will be helpful in understanding it significancy in relation to all the other areas of a personality examination. Without studying this planet's occupancy in an individual's horoscope you can never gain a true reflection of how they relax. This is an important consideration and key to many parts of life including relationships. Knowing how you or another person like to indulge and what comforts you or them can be essential information. The symbol for identifying Venus in Astrology charting consists of a simple circle and a cross. The circle of divine spirit sits on top of the cross of astral matter to form this basic icon. The shape of the Venus identifier is thought to represent the hand mirror of the Goddess Venus and symbolize beauty and charm. To remember the astrological symbol for Venus you should recall the image of a Goddess looking at her reflection. 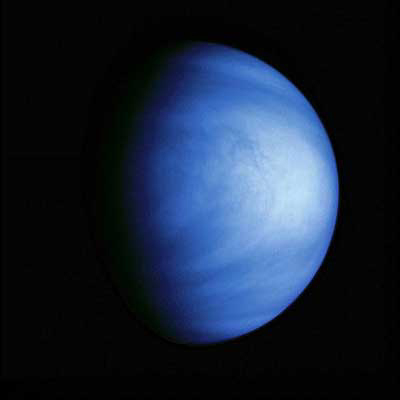 It should be easy to remember the relevance of Venus's presence and her introduction of refinement, gentleness and calm. It's influence is equally applicable to people as it is to situations and makes sense wherever it appears in a person's horoscope. Venus is ruled by the two Western astrological Sun signs of Libra the Scales and Taurus the Bull. The section of the calculated birth reading that it is located in will be most affected by its beautification. Venus's influence does not always affect human appearance it is capable of influencing mannerisms, speech, charisma or a range of other personal and behavorial qualities. This part of a horoscope inspection can add a different perspective to some of the other discoveries uncovered by a mapping of a person's birth information. It can smooth negative traits and beautify unattractive ones by simply being present. An inspection of where Venus was in its yearly cycle when a person was born can make quite a difference to the gracefulness and appeal of their overall characteristics. 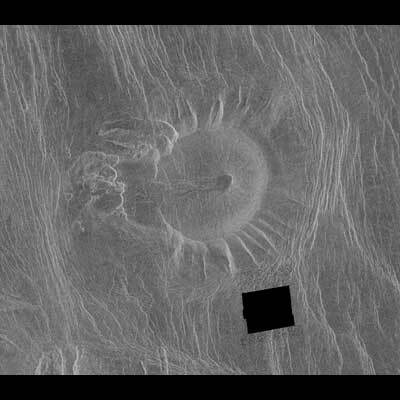 Located in the Atla Regio region of Venus is Sapas Mons. The sides of the volcano are covered with numerous overlapping lava flows, many of which appear to have originated along the sides of the volcano rather than from its double summit. 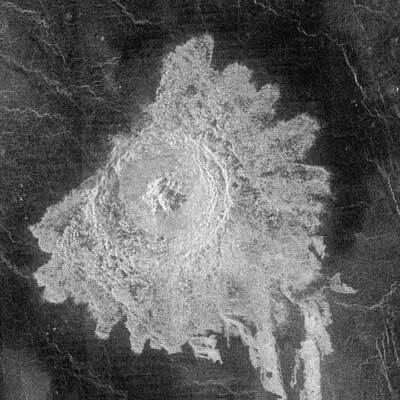 This type of eruption is common of large shield volcanoes on Earth, such as those found in Hawaii. Two groups of parallel features that intersect almost at right angles are visible. 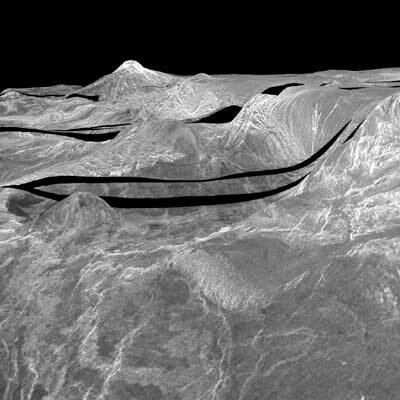 The regularity of this terrain caused scientists to nickname it 'graph paper' terrain. 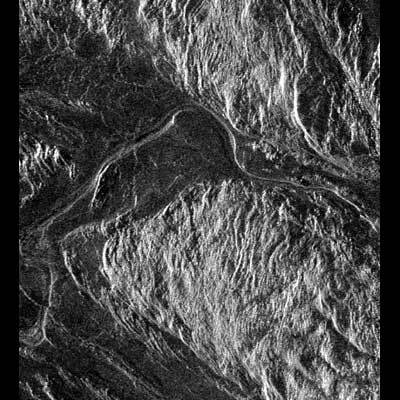 The fainter lineations are spaced at intervals of about 1 km (.6 mi) and extend beyond the boundaries of the image. 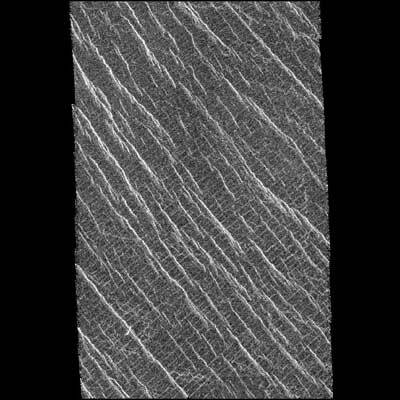 The brighter, more dominant lineations are less regular and often appear to begin and end where they intersect the fainter lineations. 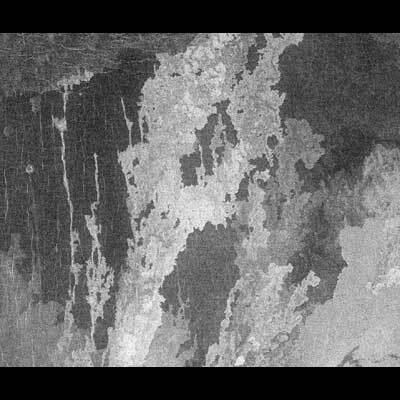 It is not yet clear whether the two sets of lineations represent faults or fractures, but in areas outside the image, the bright lineations are associated with pit craters and other volcanic features. 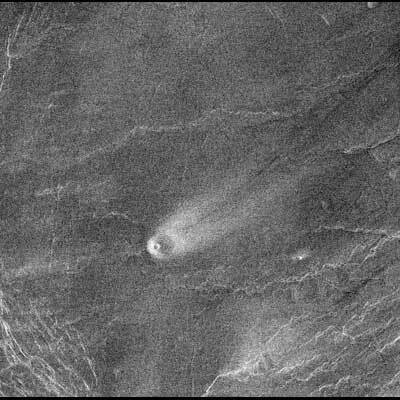 Spectacular wind streaks were found NE of Crater Mead. 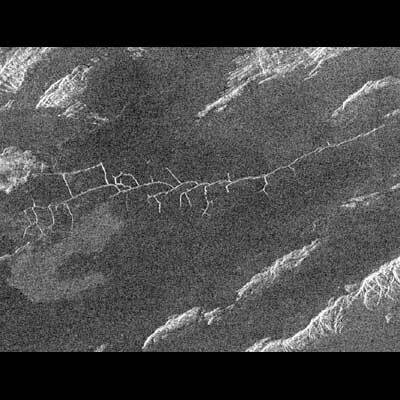 The powerful impact that created Mead spread debris 500 km (310 mi) onto the surrounding plains. The radar-bright streaks most likely represent debris from the impact that have been modified by surface winds blowing from northwest to southeast. 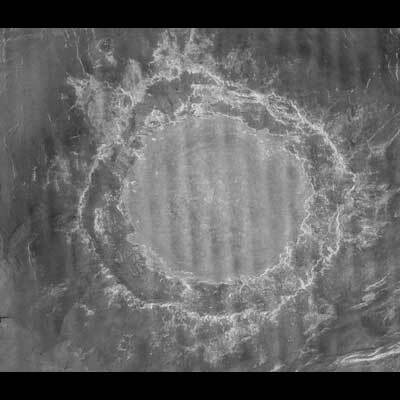 The radar-bright material is on top of an older, darker terrain. The large fault-bounded was nicknamed Gumby (after an animated cartoon figure) by Magellan scientists. Located in the Lavinia region at the intersection of two tectonic trends, Gumby measures 5 km (3 mi) wide and 100-200 m (.06 - .1 mi) deep. An example of one of the trends is the bright lines running E-W through Gumby's head. A second example is the bright lines running SW to NE through Gumby's legs and hips. The line of pits (by Gumby's elbow) suggests some igneous or volcanic activity may have accompanied the faulting. enus, the goddess of love and beauty , was the daughter of Jupiter and Dione. (In Homer's 'Iliad' Aphrodite is said to be the daughter of Zeus and Dione, a Titan goddess.) Others say that Venus sprang , full-grown, from the foam of the sea near the island Cythera. From there Zephyrus, the west wind, carried her gently on a shell to Cyprus, which was always regarded as her real home. There she was received and attired by the Seasons, and then led to the assembly of the gods. All were charmed with her beauty, and each one demanded her for his wife. Jupiter gave her to Vulcan, the lame and ugly god of the forge, in gratitude for the service he had rendered in forging thunderbolts. So the most beautiful of the goddesses became the wife of the most ill-favoured of gods. This good-natured craftsman built her a splendid palace on Cyprus. Venus soon left him for Mars, the handsome god of war. One of their children was Cupid, the winged god of love. Always eager to help lovers in distress, she was equally quick to punish those who resisted the call of love. Cupid shot golden arrows into the hearts of those his mother wanted to unite in marriage. Venus possessed an embroidered girdle called Cestus, which had the power of inspiring love and made its wearer irresistible, and she sometimes loaned it to others. Her favourite birds were swans and doves, and the plants sacred to her were the rose and the myrtle. Aphrodite was worshiped chiefly as the goddess of human love. She was also widely venerated as a nature goddess. Because she came from the sea, sailors prayed to her to calm the wind and the waves. The poets of Greece and Rome never tired of singing the praises of the love goddess. Their sculptors carved countless figures of her. The most celebrated statue of Aphrodite in ancient times was that carved by Praxiteles at Cnidus, on the coast of Asia Minor. This has never been found by archaeologists. The most famous one that remains today is the beautiful 'Venus de Milo', now in the Louvre in Paris. In the 'Iliad' Aphrodite is called the Cyprian or Cytherea. She is also referred to as Dionaea, after her mother, or even Dione. Other names for her are Aphrogenia, Anadyomene, and Astarte. It is often written Ashtoreth, particularly in Bible references to Philistine idols. The name may have been derived from that of the Assyrian goddess Ishtar. You can relax delightfully on a long journey when someone else does the driving. Your mind is clicking away, and it's a good day to make a major decision. Talk to your pastor and to people who belong to your church and community. Despite numerous obstacles, be persistent in developing your newest creative ideas. Nieces and nephews are well represented in your chart today. A pouting, petulant, and piquant situation, possibly involving loved ones, is indicated for this morning. Health, travel, money, possessions, and friendships are all well aspected during most of this good day. It's a day when you keep on the go but don't accomplish too much. You accept changes that others have foisted upon you. Keep in close touch with the one to whom you owe your love. You may feel fine, but something is amiss. Give thought to spiritual ideas that arise; you may reach a new plane of cosmic understanding.